Someone please help. 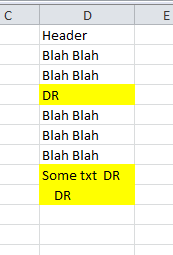 I'm trying to write a VBA code that searches for a particular word "DR" in my excel worksheet column "D" and then delete the entire row. There are lots of occurrences of the particular word in the worksheet. All I want to do is to search for the these occurrences and then delete the entire rows that contains those words. My problem is that I'm not sure what loop structure to use. Below is the code I'm using. I'll be glad for an assistance. .AutoFilter Field:=1, Criteria1:="=*" & strSearch & "*"
The below example is similar but it starts at the bottom and works its way to the top in reverse order. It deletes each row at a time instead of all at once. How can you write a VBA script to delete all cells in a range containing a certain string?